I totally failed today lol. Well I only failed at not doing anything productive because I spent the whole day catching up on Glee. Yes, I am addicted. I started from the very beginning late last week and I layed in bed watching it. However, I did manage to eat healthy and stay under my calories. Happy Birthday to my cousin Elaine!!! It’s her Birthday today and she’s having a family party so I am in Madison, WI for the night. I knew there was going to be a lot of food so I did not keep track of my calories for today. I wish there were more hours in a day. I didn’t have the time to get to the gym before they closed tonight. But I was able to get my work out in at home on the TorsoBall. I usually work out in a different room because it’s bigger than my bedroom but I tried working out in my room. I normally use my iPhone which is docked on a portable speaker and I played my music from my computer so I was able to use the stopwatch on my phone to be exact on the time during my exercises. I felt like I got a better work out and had a good sweat going for some reason. I had a great response to my postings online for the TorsoBall along with my before and after picture. I can’t thank everyone enough for your tremendous support. I am very proud to announce that the TorsoBall has launched and is now available! The infomercial airs tomorrow morning on Oxygen at 4:30am, CNBC this Saturday at 5:30am, and again on Oxygen on Sunday at 5:30am. All times are Central time. If you don’t want to wait, you can view it below or at http://rwadv.com/TorsoBall/TorsoBall.html. 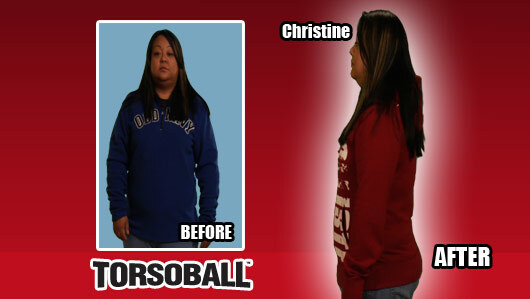 Again I won’t be in the initial infomercial but my before and after picture is on the website at http://torsoball.com! My before picture was taken before I started working out and dieting and my after picture was taken on January 31st at 22 pounds lost. I have lost 12 pounds since then. If anyone has any questions on the TorsoBall, feel free to email me! After watching the TorsoBall infomercial and visiting the website, I got more pumped up and gave me the extra boost I needed. I did my stretching and three circuits on the TorsoBall at home and finished at the gym on the elliptical and doing HIIT. I only worked half-way through HIIT because I started feeling dizzy. I think it’s from me staying up very late the other night and waking up late. I haven’t stayed up so late and slept in like that in a long time. TorsoBall Creates Zero Impact Sculpted Body Workout The only abdominal-specific fitness product creating a full-body workout while exercising core muscles. LAS VEGAS, Feb 24, 2011 (BUSINESS WIRE) — One of the most innovative fitness products ever created, the TorsoBall (www.torsoball.com) is uniquely engineered as a contemporary replacement of the classic exercise ball. The TorsoBall combines the fluid rotation of an exercise ball with a unique handle design structured to provide a full-body, zero impact workout with emphasis on the abdominals. “After 20-years of watching people struggle in the gym and at home as a fitness instructor I wanted to create a product that anyone can use effortlessly to achieve their fitness goals,” said creator Jerry Abbott. “We took the exercise ball and made it cutting edge.” TorsoBall’s genius lies in its simplicity. With external, padded handles serving as a stable axis it allows users to roll the ball freely back and forth providing optimum abdominal stimulation while engaging every upper body muscle simultaneously. The recommended six-week program helps people attain overwhelming results. “…I have a personal goal of losing 60 pounds, I now know I can get there because of TorsoBall. I not only love the difference in my body, but I am also happy with how I feel.” Michelle G. — 60 Day Challenge — lost 30lbs. “…The nutrition wasn’t starving my way thin, the workouts were relatively easy and certainly easy to fit into my schedule and the circuit training was great for getting my heart rate going. ” Sean R. — 60 Day Challenge — lost 40 lbs. “…I am proud that I am leading by example to my children and am having a lot more fun being active with them, it’s because of the TorsoBall. ” Cindy M. — 60 Day Challenge — lost 17 lbs. TorsoBall helps people of all levels to customize their workout by attaching the special slingshot power cords to the handles. This takes a once challenging exercise and turns it into something all fitness enthusiasts can easily perform. Individuals will receive the TorsoBall, a set of resistance bands, an instructional DVD and full nutritional plan. Individuals can add the advanced slingshot power cords to increase the levels of the workouts. About TorsoBall: One of the most innovative fitness products ever created, the TorsoBall (www.torsoball.com) is uniquely engineered as a contemporary replacement of the classic exercise ball. The TorsoBall combines the fluid rotation of an exercise ball with a unique handle design structured to provide a full-body, zero impact workout with emphasis on abdominals. About Jerry Abbott: Jerry Abbott has been passionate about the health industry for 20-years. After finishing college he obtained his certification as a personal fitness trainer from the International Sports Science Association. In his attempt to deliver an innovative way for people to exercise, Jerry created a mobile business enterprise called Fitness On Wheels. Jerry customized fitness instruction to his clients of all fitness levels in the convenience of their homes. Not a whole lot to report today. I woke up feeling sore once again since I worked out yesterday. It felt good to feel the soreness though. I did some stretching from home and did the full three circuits on the Torso Ball.